Today is the first Saturday of November, so I introduce to you the first author up for interview: S.J. Kincaid! She is the author of Insignia, a book which, to be honest, I wanted to read because of the cover. But the actual book is rather amazing, so have a read of (and be sucked in by) the synopsis and get yourself a copy of the book. And we also have a giveaway. S.J. 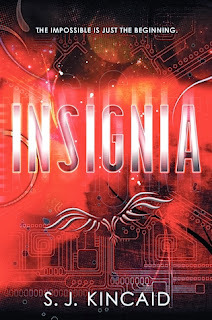 has generously agreed to give away personalised copies of both Insignia and its sequel Vortex! So, have a read of the interview and then enter the amazing giveaway. So, being featured for sci-fi month, I'm going to start by asking two questions about science fiction. 1. What do you think is the appeal of sci-fi? For me, sci-fi appeals because it encompasses so many possibilities we don't get to see in real life, yet due its roots in science, it maintains an element of realism we don't see in fantasy. Star Trek and Lord of the Rings are both awesome, interesting, with fascinating worlds, but at the end of the day, the only one of those I could actually hope might happen is Star Trek... Er, if we're ever technologically far, far more advanced than we are now. 2. Why did you decide to write sci-fi? I watched a lot of popular sci-fi growing up, so I've always been into it. I just sort of fell into it after several manuscripts. And now, time for the random questions! 3. Describe your series in three words. 4. Are you working on anything else other than the third book in your series? If not, any hints of what’s to come in the third book? I've finished the initial drafts of the third book. The third book features consequences as a result of everything that's come in the two books prior. 5. If all of your characters were put into The Hunger Games, who do you think would come out on top? Yuri Sysevich. Tom would manage to alienate the most dangerous Career and get himself targeted to be killed early on, Vik would laugh too loudly and someone would come after him. Wyatt would be too neurotic about water-borne or food-borne pathogens to eat or drink anything and weaken that way. Yuri would win just because that's the sort of thing Yuri would do effortlessly. And he'd somehow do it without making any morally questionable decisions or tainting himself, just because... He's Yuri. 6. It’s fairly rare to see a YA book written from a male perspective; why did you decide to write Insignia from Tom’s POV? I actually tried rewriting INSIGNIA with Tom as a girl named 'Max', just because I thought it would be likelier to sell/get good marketing if I had a girl protag, but the thing that stopped me was thinking of Medusa's character as a boy. That's just been done too many times. 7. In the books, the well-known Combatants tend to go by call signs e.g. Medusa, Ares. If you had a call sign, what would it be? I really need to read this book! I have seen a bunch of positive reviews, having male protags is always refreshing since there are so many in a female perspective. Eeep the book sounds so good! It's definitely interesting to have a male protagonist as there just aren't enough of them in YA fiction, so I'm glad the author made that decision! Lol about Wyatt in the Hunger Games. I love this series so much. The characters are all so well developed. It's interesting thinking about the book being told from a girl and Medusa being a boy. I'm like that it was done the other way around. Tom's voice is so strong as an adolescent boy. I couldn't imagine him as a girl at all. Great interview! I love hearing more about this series. This books sounds like it's all kinds of awesome! I haven't gotten the chance to read much YA with a male protagonist so I'm definitely looking forward to that. A male protagonist? YA? Hera as a call sign? Interesting!!! Interesting sounding book. I love the cover! What a fun interview! I love her explanation for who would win if they all got thrust in the The Hunger Games. I have to agree that Yuri would probably win, lol. Awesome interview, love the questions. I haven't read the books yet but I really really want to. Sounds pretty unique. Thanks for the giveaway!